Poseidon. . HD Wallpaper and background images in the ग्रीक पौराणिक कथाओं club. lovely sculpture.it captures Poseidon's essence. Its got mevement almost like the waters he ruled over. I like Poseidon in all of the Gods....she's so mighty and specially I like his element WATER!!! I am Half Greek. I am part of a Bay Area theatre company Thunderbird theatre, that is doing a wonderful original comedy about the Greek God Poseidon which will be playing in San Francisco. We think that it would be a perfect place to have a meetup. I'd like to send your contact info to the head of our Marketing Department so we can contact you for a future date that you all can make a showing. It would be so fun. Please send me your contact info. Written by Dana C. Constance, Bryce Allemann, and Kathy Hicks. Directed by Christopher P. Kelly. Madcap farce, sledgehammer wit and cheeky behavior rule the day as the wonderfully rude god of the sea Poseidon and his dutiful but inept hotel staff of sea creatures vie to host the first Olympics in a colossal competition of manners and hospitality. 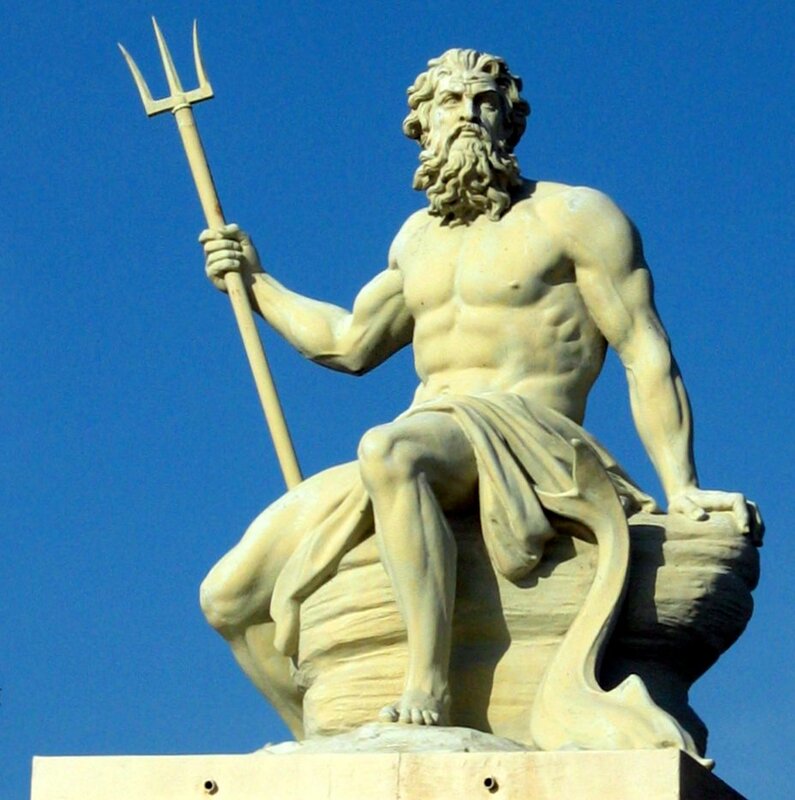 Dimwitted Poseidon, the most underappreciated God of Mount Olympus and proprietor of a 2-star hotel at the bottom of the sea, is hoping for respect and redemption by vying to host the first Olympics. Can he, his venomous wife Medusa and a bumbling staff of sea creatures pass muster? Or will the clever goddess Athena outfox the short-fused Poseidon once again? The guest list includes a litany of insatiable gods behaving badly, a mounted singing toy fish and the optimistic one-hit wonder Bobby McFerrin… It is just another farcical day under the sea at Salty Towers. in seeing the show. I would love to get in contact with the person who started the fan club.